Saving the environment one step at a time! You can do your part by downloading the Carpool Scheduler to organize groups for the sake of the environment and your wallet. Carpooling is one of the greatest resources for saving money on fuel. Everyone has coworkers or classmates, so why not cash in on your shared commute together? Use the Carpool Scheduler to make everything easy, so you can be on your way! Start by downloading the file below. Once you click on the new document, you are ready to start optimizing your carpool schedule. The first tab, titled “Notes”, gives you a convenient list of instructions that will guide you through the various features and functions for the template in the fastest way possible. Simply read through the instructions and continue to the next tabs at the bottom of the page. The next three tabs highlight an overlapping schedule to illustrate who will drive on what day. The name for each driver is color coordinated, so you never miss a day! The right side keeps track of the number of trips a person has made. This number should balance out if your group rotates after each person. You can keep track of multiple carpool schedules for work, school, or even for the people in your life, like your children. When you’re done entering the information for your carpool, press the “File” tab in the top left corner, and select the “Print” option, to have the file sent to your printer. You may also choose the “Save As” option to store the Carpool Scheduler on the computer. 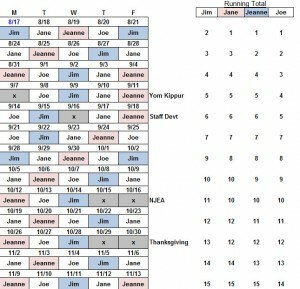 With this schedule you can finally organize the chaos in your life. If you are someone who is environmentally conscious or you even just want to save a lot of money over the year, then this template is the perfect tool to keep track of your busy schedule.